Lake Calhoun is one of Minneapolis' largest and most popular lakes. Lake Calhoun is immediately west of the fashionable Uptown neighborhood, and as such, is popular with the beautiful people and the cool kids, fitness enthusiasts, hipster families, and those who love people-watching. The Calhoun Yacht Club and Minneapolis Sailing Center use the lake extensively, launching from the boat ramp and docks on the northeast side of the lake. Also at the northeast corner, Wheel Fun Rentals has kayaks, canoes and paddle boats to rent by the hour. Lake Calhoun is connected to Lake Harriet and Lake of the Isles by canals for a longer paddle. Lake Calhoun is very popular for the walker, runners and cyclists. It's no surprise. 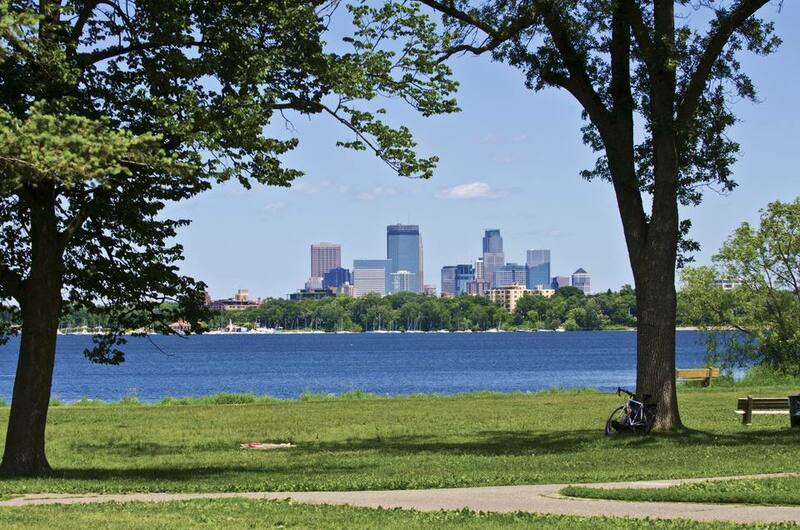 Lake Calhoun is surrounded by parkland and views of downtown Minneapolis, and while it's busy, it does offer some of the Twin Cities' best people-watching. The trail around the lake is 3.1 miles for runners and walkers, almost exactly a 5K run, and 3.2 miles for cyclists. The trails around Calhoun connect to the trails around Lake Harriet, Lake of the Isles, the Midtown Greenway, and other trails around the area making it easy to incorporate into a longer run or bike ride. There are three beaches at Lake Calhoun. One is at 32nd Street on the east side of the lake. The North Beach is on the northern edge of the lake, and Thomas Beach is at Thomas Avenue in the far south of Lake Calhoun. North Beach and 32nd Street beaches have an adjacent playground, so are popular for families. Thomas Beach is for serious sunbathers. But serious sunbathers surround the lake, spreading out towels and sun lotion on the grassy parkland around the lake. Where you lie depends on how much you want to be seen - sunbathing on the north or east side of Lake Calhoun isn't for the shy. Fishing is popular at Lake Calhoun with several fish species. Of course, during the winter, when Lake Calhoun freezes over, ice fishing is popular, too. Another sport at Lake Calhoun during the winter is snow-kiting, using a large kite to ride around the lake on skis or a snowboard. The east side of Lake Calhoun is Uptown Minneapolis and parking is at a premium. Some street parking exists, more the further south you go, or you can pay to park at one of the many meters or in the several Uptown Parking lots. Parking on the west side and south of the lake is more abundant and usually free. Several Metro Transit buses serve Lake Calhoun, the Uptown Transit Center on Hennepin Avenue is less than five minutes walk away, and bike paths connect to Lake Calhoun from other lakes, and the Midtown Greenway terminates on the north shore of Lake Calhoun. Uptown Minneapolis is just blocks away and has plenty of coffee shops, bars and restaurants to choose from. On the west side of the lake, The Bakken Museum has gruesome historical medical devices, electric eels, real-life horror stories and science experiments for kids and adults in a mansion surrounded by beautiful and scientific gardens. The Bakken Museum holds regular evening events at the museum and in their grounds by the lake.